St Bartholomew Church: Who was St. Bartholomew? St. Bartholomew (known as Nathaniel in St. John's Gospel), was a doctor in Jewish law and a dear friend of St. Philip the Apostle. He went willingly with Philip to see Christ and recognized the Savior immediately as the Son of God. On that initial meeting, Jesus uttered the glorious compliment, "Behold, an Israelite indeed in whom there is no guile!" After having received the gifts of the Holy Spirit on the first Pentecost, Bartholomew evangelized Asia Minor, northwestern India, and Greater Armenia. In the latter country, while preaching to idolaters, he was arrested and condemned to death. His holy body was first taken to the island of Lipari (north of Sicily), then to Benevento, and finally to Rome on an island in the Tiber where it is honored by the faithful with pious devotion. 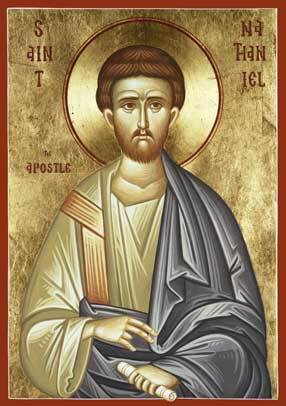 St. Bartholomew's feast day is celebrated on August 24.